I have wrote and spoken several times recently about how increasing user acquisition costs are impacting the social game industry, particularly social casino, and some strategies to offset and even capitalize on this trend. One of the best ways to combat this problem is to focus your resources on reducing churn rather than acquiring new users. As the cost of acquiring a user increases, the cost of replacing that user also increases. While companies devote ever larger budgets and build bigger teams for user acquisition, they fail to devote comparable resources to retaining the players they already have. Moreover, in the social casino space, players often play 3-5 apps, so the less they play your title, the more they are playing a competitor‘s slot. I recently came across a blog post, “How to reduce Churn by building a bulletproof retention process” by Andrew Tate, that lays out five ways that you can reduce churn. Tate starts with the example of Burbn, a Foursquare clone that had a huge churn issue. Using analytics, the team saw that users found it too complicated and were using the app to post pictures rather than check in. So they modified the app based on this data to reduce churn and renamed it Instagram. Let’s just say it worked out okay for the Burbn team. This example shows how a focus on reducing churn can be the difference between failure and billions. The first step to combating churn is to take a lot of small steps rather than looking for the magic formula. One change or feature is not going to improve retention 50 percent. If you can reduce churn a few percent every build, you eventually will get negative churn rather than seeing your game lose all its users and revenue. Thus, it is more critical to build a process that always is working to reduce churn rather than fire off a churn reducing feature and then go on to your next KPI (key performance indicator). Social casino is one of the bloodiest of red oceans, with excellent well-financed companies competing ferociously. The best path to success is to take a Blue Ocean approach. Blue Ocean is all about turning non-customers into customers, rather than competing for the same customer. You do this by looking at what you can remove from the existing product offering, what you can add, what you can increase and what you can reduce. This leads to a new offering that appeals to new users. Last week I wrote about the rising cost of paid user acquisition. this week I want to dive deeper into how advertising can help mitigate this issue. Ironically, my former employer, Zynga, made a creative move recently in this direction. Zynga announced SponsoredPLAY, an in-game advertising product where sponsors offer special content or levels that enhance rather than detract from gameplay. I do not know enough about the offering to comment on it directly but it shows how game companies need to think to thrive in the coming age of higher cost per installs. Last week I discussed the fundamentals of the paid user acquisition space and why it pointed to dramatically higher CPIs (cost per installs) in the near future. There are several options to cope with this situation but one of the strongest is to increase advertising revenue in your game. Once advertising becomes a significant component of your revenue mix, any increase your CPIs due to higher advertising rates should also generate additional ad revenue on the other side of the equation. The more CPIs increase, the more your ad revenue increases. 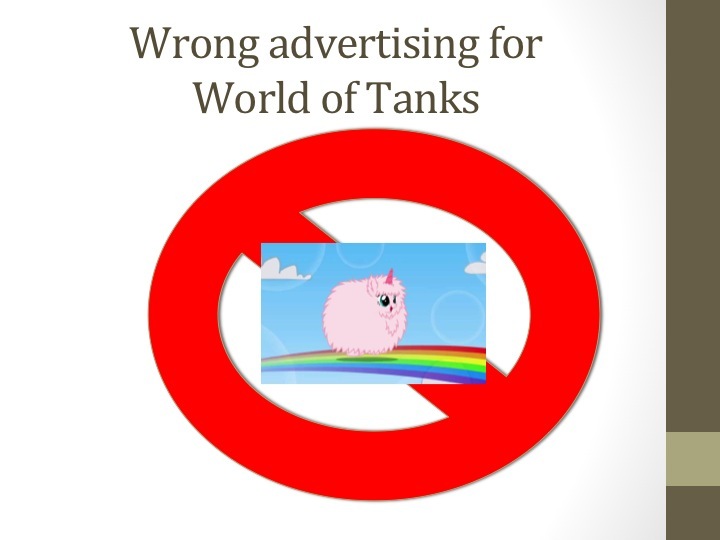 Unfortunately, increasing advertising is not as easy as putting banner ads in your games. Last January I wrote how consumers are much savvier now and expect their communications with companies to be as smart and sophisticated as they are. The same holds true for advertising. Targeted: The advertising should be relevant to the customer. A 50-year-old man should not see an ad for a Miley Cyrus concert. Contextual: The advertising should fit naturally with the overall game experience. You should not be playing Game of War and all of a sudden see an advertisement with pink fluffy unicorns dancing on rainbows. Beneficial: Rather than having the advertising annoy the player, enhance their experience. Use it to deliver benefits that they would not normally receive. Segment: You do not have to show ads to everyone. You may only want to show ads to non-spenders. If the ads are truly beneficial, you may actually want to show them more frequently to spenders. The important thing is to create as small clusters as possible and then create an advertising strategy that optimizes the value for that cluster (IAP [in-app purchases], subscription, advertisements). Multiple formats: You should not limit your advertising strategy to one type of advertising, just as you would not limit your in-app purchases to only allowing players to buy chickens. Different types of ads will work in different parts of your game and some types will be more relevant to certain users. 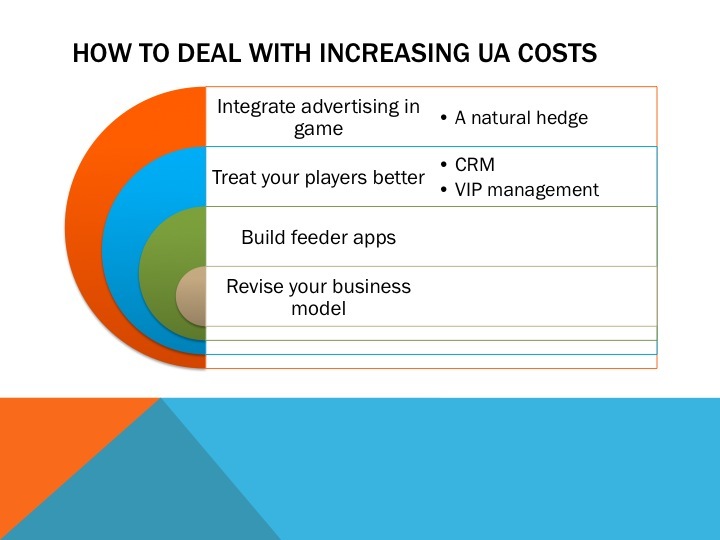 Use the full arsenal of advertising to optimize your player’s experience and the revenue they generate. Flexibility: The digital marketing world is still in its infancy. Rather than have a laser focus on one ad unit or strategy, keep abreast of developments in the industry and continually evolve your strategy as best practices evolve. If you are attending Casual Connect next week, please stop by the panel I am on about user acquisition Monday morning at 11 or my talk about bringing Blue Ocean Strategy to social casinos Monday at 16:30 (4:30 PM for you Americans). I look forward to seeing you there. I have seen many disparate data points recently that when looked at holistically show how the free to play business model needs to evolve from relying on in-app purchases. While previously a strong in-game economy that generated significant revenue from in-app purchases was sufficient to create large profits for successful games, changes in the economics of the industry suggest in-app purchases will not be enough to support even successful games. The obvious answer is the advertising model, but even this model needs evolution to keep up with the times. 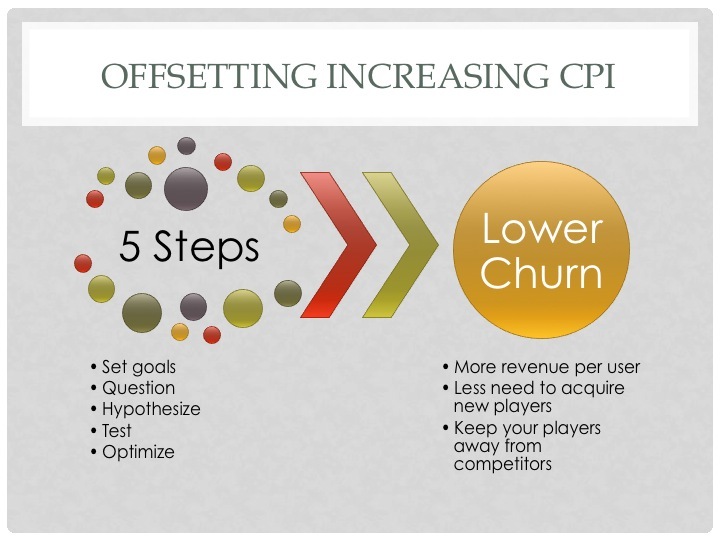 There are multiple data points that suggest CPIs (cost-per-installs) for performance marketing are not only increasing, but are likely to increase at the rate where they will surpass the lifetime value of acquired users for most games. Most of the major game publishers are planning to grow through the launch of multiple new apps, particularly in the social casino space (where user acquisition costs are already high). While speaking colleagues recently, I learned that two of the major social slot companies have three new SKUs each planned for 2016, with planned spend of over $250,000 per day for each company already budgeted. They also expect their major competitors to each launch 1-2 new SKUs next year (and all in the first half of next year). CPIs are simply a matter of supply and demand, and given that the advertising inventory is not increasing, it is inevitable that the cost of installs will increase. Even if the new apps are not targeted in your space, there is a limited number of people who will download a game and these companies will start to target your potential customers also because they will dry up their demographic. Companies from outside the game industry often envy our industry and try to replicate our practices to improve their profitability. They often refer to this practice as “Gamification,” presumably making products like waste removal as entertaining as games. At the end of the day, they usually fail miserably but never understand why. The reason why they fail, though, is that these companies are gaining the wrong lessons from the game industry. Games, almost by definition, are an entertainment industry. People play games because they are fun. The problem is people do not take out the trash or stop smoking because it is fun. And you don’t make these activities fun by “gamifying” them. For most of these companies, they are not really looking at trying to create an entertainment product, they are actually trying to manipulate customers. They understand how games can be habit forming, to use the terminology of Nir Eyal in Hooked, but most of the companies are actually hoping to create an unhealthy addiction. Many outside the industry, and some unfortunately inside the industry, believe people play games only due to the retention and monetization mechanics. It’s the simplification of games, referring to them as Skinner boxes, that lead people down the wrong path. The companies that feel games are about manipulation are not successful when they try to apply game mechanics. The problem occurs because successful games are not successful due to manipulation. They are successful because users get an entertainment value. Sometimes these techniques do enhance monetization or retention to the detriment of gameplay, though in those cases the game normally implodes, but if the person is not having fun in the game they will not come back or spend money. Even the game companies that do not realize the goal is for the player to have fun also fail, you can’t succeed by tricking players. 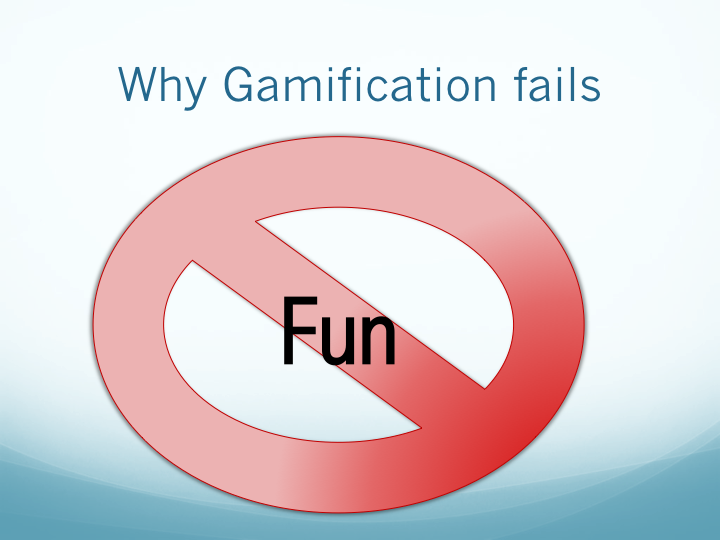 And that is the problem with gamification; the goal is usually manipulation and not entertainment. They are trying to turn something that is not fun into something that people will use more often or spend more money on by adding leaderboards or spoilage or a collection mechanic. None of these things create fun, and the gamification fails.